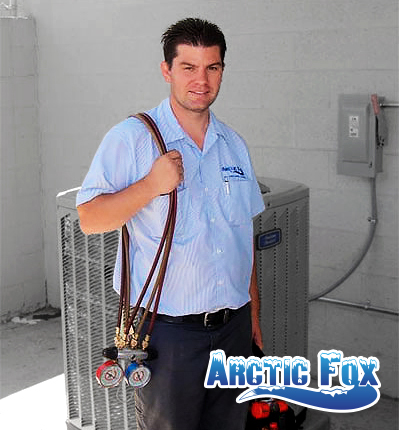 Arctic Fox Air Conditioning & Heating specializes in all facets of air conditioning services. Our many years of experience and attention to detail are why our customers call us first whenever they need additional air conditioning services. Keep your air conditioner performing effectively and efficiently with one of our air conditioning maintenance service programs. Our programs include diagnostic and cleaning services to catch issues before they become major problems, especially during Arizona’s summer months. Our experience with a wide variety of air conditioning units means that we can make repairs to any system. All of our AC repair services are priced by the job -- not by the hour -- so that you will know exactly what the cost for each repair is upfront. We also offer emergency service. We professionally install new air conditioning units from the top industry manufacturers. Our air conditioning technicians will rewire, ensure proper ductwork is in place, and design efficient drainage systems during an installation. Interested in a viable alternative to traditional air conditioning. Evaporative coolers have become a favorite cooling solution for Arizonans, providing a number of benefits including energy efficiency and dry-climate performance. We take great pride in the air conditioning work that we do because your satisfaction and comfort is our goal. The Arctic Fox Air Conditioning & Heating technicians service homes in Phoenix and in West Valley communities like Peoria, Litchfield Park, Glendale, Sun City, and surrounding communities. To schedule air conditioning service for your home, give us a call at (623) 533-5718 or send us an email.